Mary Emma's daughter Norah Tree (1901-1991) met Charles Pankhurst (1899-1946) when they both worked at Queen Mary's Hospital, Sidcup. Norah was there briefly as a ward orderly, but Charles made a career in nursing. In this photograph he is standing fourth from the left, dressed in white, in the back row. 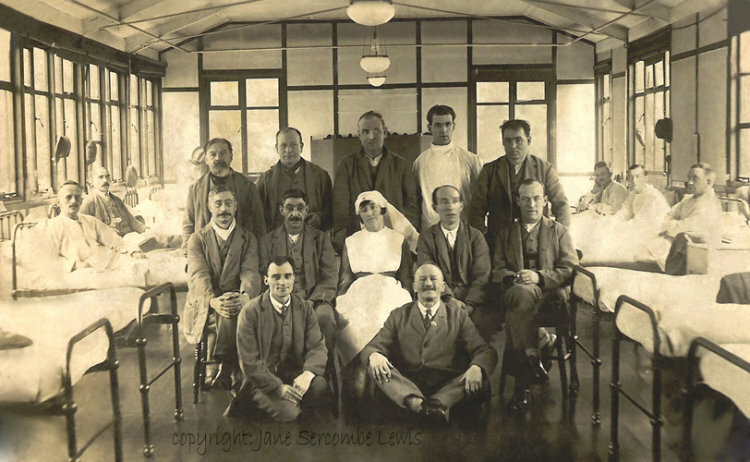 Queen Mary's was at Frognal House and, for a period from 1917, was where Dr Harold Gillies pioneered new techniques in plastic surgery to make facial repairs to men drastically wounded during the Great War.